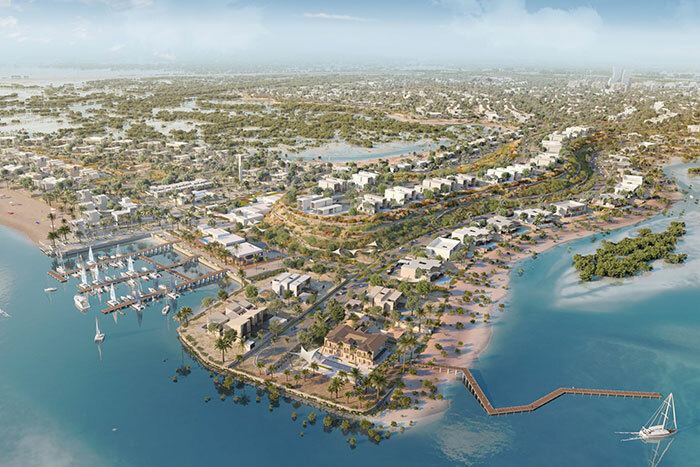 Jubail Island, poised to become Abu Dhabi’s most desirable residential sanctuary designed to appeal to wellness and nature enthusiasts, today marked its official launch in the UAE capital. Developed across 400 hectares at an estimated cost of AED5 billion, the diverse and meticulously planned low-density community – designated as an Abu Dhabi investment zone, will comprise a mix of serviced plots, high end and midrange properties that cater primarily to the requirements of nationals and the rental market. Set to feature six investment zone villages – Marafaa Al Jubail, Nad Al Dhabi, Seef Al Jubail, Ain Al Maha, Souk Al Jubail and Bed’a Al Jubail, Jubail Island is strategically located between Yas Island and Saadiyat Island. With a pristine 13-kilometre waterfront and a stunning natural setting surrounded by mangrove forests teeming with wildlife, Jubail Island offers plots ranging in size from 1,500 to 5,000 sq m as well as villas ranging in size from 300 to 1,200 sq m. The development is a short 15-minute drive from downtown Abu Dhabi and only a 50-minute drive from Dubai Marina. The development is also within easy access to key attractions such as Louvre Abu Dhabi, Yas Mall, Al Maryah Island and Abu Dhabi Island. Comprising 400 single-family and 400 multi-family homes, the project is slated for completion in Q4 2022, varied ownership options mean that plots can be arranged for handover as early as Q1 2021. Once completed, Jubail Island will be home to between 5,000 and 6,000 residents. In the heart of this environmentally conscience and sustainable community will be the Town Centre – an intimately cosmopolitan hub featuring apartments, an office park, office villas, and a hotel. Facilities will include F&B outlets, a beach club, a business centre, a sports centre, schools, supermarkets, nurseries, a community club, specialised clinics and other commercial establishments. Jubail Island Investment Company (JIIC), the developer of the project, has appointed Lead Development as the development management firm, with Arquitectonica from the USA, Ramón Esteve from Spain and the global practice Broadway Malyan making up the consortium of international architects and planners. With a Pearl Rating from Abu Dhabi’s Estidama certification system, the project is also set to significantly enhance the island’s natural ecosystem through planting new mangrove forests as well as adding over 10 kilometres of canals and other new marine habitat that will be home to migratory birds, fish populations, sea turtles, and gazelles. The development will also boast generous outdoor areas to include parks, hiking paths, kayaking stations and cycling routes for nature lovers and water sports enthusiasts.